“Burn the skin of the chicken, disembowel it and rinse.” Just the instructions I want to read on a beautiful sunny spring morning. “Separate skin and meat from the bones and put through the mincer” – I really must find a more sunny-weather-appropriate recipe to go with my kotlety po-pozharski (a kind of chicken patty). Looking through the Book, I find a salad called Vesna (spring), which sounds perfectly appropriate – let spring reign in the kitchen as well as outdoors I say! Looking further into the recipe, I wonder why boiled carrots, potatoes, sour cream and icing sugar would be in a salad named after spring. You could ask why icing sugar would make its way into any vegetable salad, but then you’d be accused of being too curious and probably told to go back home. “The curious Varvara had her nose taken off at the market,” as a Russian saying goes. I still want to ask how the salad I’m making got the name of Vesna, but something’s telling me I won’t get an answer anytime soon. So many of the Soviet dishes had incredibly unimaginative names – salad “stolichny” (capital city), bread “moskovsky” (Moscow), gorodskaya (city) pastry and many more. As usual, in this moment of doubt I turn to my grandmother. “Some old names remained the same, like with kotlety po-pozharski [named for Prince Dmitry Pozharsky], others got transliterated from foreign words – like éclairs or Napoleon cake, and the dishes from the republics kept their original names like ‘kharcho’ or ‘plov.’ Keeping these names was a way to show that all republics were equal. “But when they came up with a new dish, then there were no specific rules as to what to call them. The name givers were probably afraid to use the wrong word and went for something simple and safe. Unimaginative names to unimaginative dishes! I can just see a Soviet poster with Vesna salad on it. I finish my lunch and it finally dawns on me: it must have been the lettuce – the pale green leaves must have inspired the name. Now I just have to wait for that pale green to appear in the streets, too! Burn the skin of the chicken, disembowel it and rinse. Remove the skin and meat from the bones, then mince together. Add chicken mince to white bread soaked in milk. Mince again and add some butter and salt. Mix well. 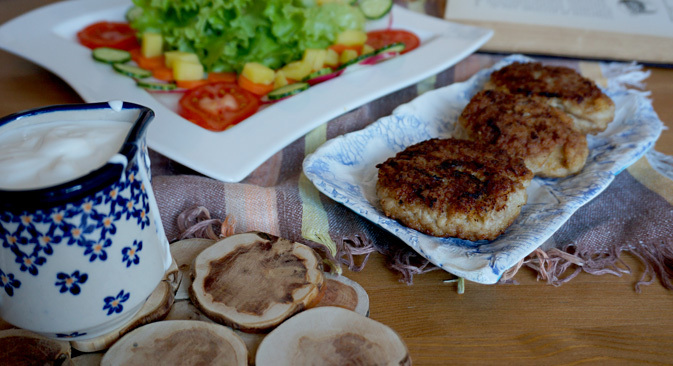 Form the ground meat into small patties and roll in bread crumbs. Fry the cutlets in butter in an oven-proof skillet for 4-5 minutes on each side, until they are slightly browned. Then, place the pan in a hot oven for about 5 minutes, or cover and leave for a while on low heat until patties are completely cooked. To serve, put patties on a dish and pour melted butter over them. Kotlety can be served with vegetables such as peas, beans, cauliflower or roasted potatoes. Use the remaining chicken bones and giblets to make broth. Wash, dry and tear lettuce, then put in a salad bowl. Around the lettuce, arrange slices of carrots, tomatoes, potatoes, radishes, cucumbers and green onions. In the center of the lettuce, place slices of hard-boiled eggs. Salt lightly. To make the dressing, combing sour cream, vinegar and sugar. Serve dressing separately.